Starting location: Top of Shenandoah Mountain on Rt. 33. From Harrisonburg, VA, travel 22 miles west on Rt. 33 to the top of the mountain; the parking lot is on your left after crossing into West Virginia. The trailhead is in the far corner of the parking lot, next to the road. Description: You will begin walking from the northern end of the Shenandoah Mountain Trail. To begin, walk around the parking lot guardrail and carefully climb down the rocks on the yellow-blazed trail. The trail will quickly level out to a rolling dirt path, and then climb steadily. After one mile, the trail will intersect with High Knob Trail. To the right, the trail descends to Brandywine Lake. Take the left-most trail toward High Knob. It will immediately ascend sharply and emerge onto a gravel road. Turn right on the road. After about ¼ mile, take the trail to the left at the sign. Continue up grassy road to the historic High Knob Fire Tower (it will feel like more than ¼ mile - just keep trudging)! Follow same trail back to the parking lot. Why we like it: This hike is short with a big pay-off. High Knob, at elevation of 4,107 feet, offers incredible views all the way around. 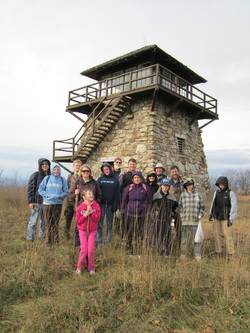 The old fire detection tower was built by World War I veterans and the Civilian Conservation Corps and was once used by fire wardens for spotting fires. The tower was renovated in 2001-2003 and today is a beautiful reminder of our past; with population increases, fire wardens are no longer necessary in our national forests. On each side of the fire tower, a legend identifying the distant mountains is posted in an upper window. Poison ivy and thistles may be present on the rocks at the beginning of the trail, and in the grassy area surrounding the fire tower. Be alert! Expect higher winds and colder temps at this elevation. The fire tower is a good birding location; you might see peregrine falcons, hawks, migratory song birds, and other rare species. To the east from High Knob, you can see Switzer Lake at the bottom of the mountain. Switzer is the drinking water reservoir for the city of Harrisonburg; you can drive there on FDR 227, descending to the south from Rt. 33 about halfway up the mountain.